Here it is – our very first podcast, and guess what – it is on supraglottic airways! 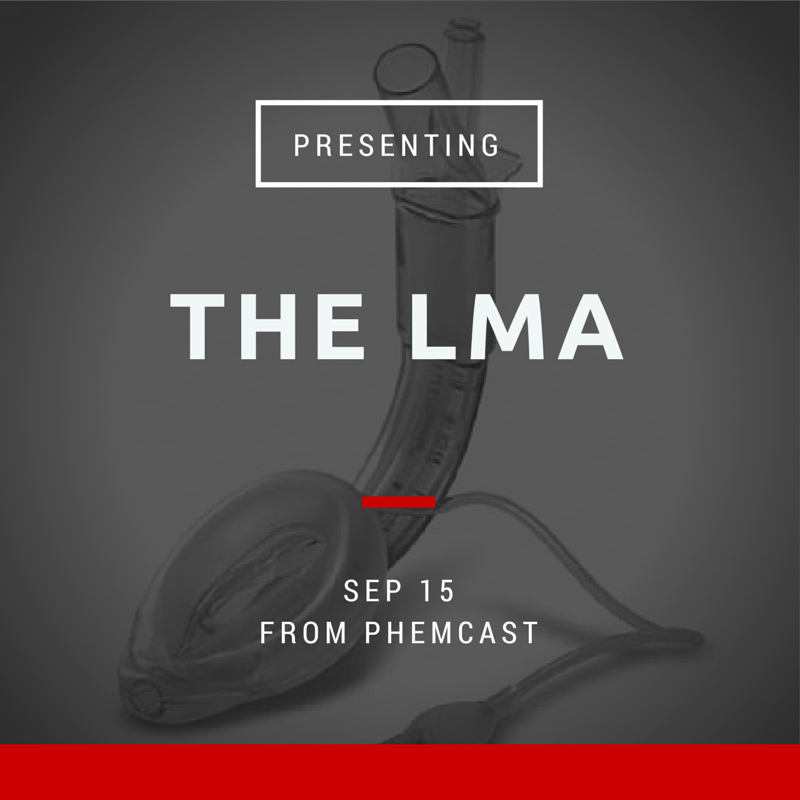 This first episode reviews the history of the laryngeal mask airway and we discuss the relative benefits and risks of supraglottic airway devices. We’ve interviewed Dr Rob Moss, author of the Faculty of Prehospital Care (FPHC) Consensus Guidelines on pharmacologically assisted laryngeal mask (PALM) insertion. Click here for the link to the guideline. We also met Professor Jonathan Benger and discuss the role of supraglottic devices in patients in cardiac arrest. Please have a look at the airways 2 trial website here. Benger JR, Voss S, Coates D, Greenwood R, Nolan J, Rawstorne S, et al. Randomised comparison of the effectiveness of the laryngeal mask airway supreme, i-gel and current practice in the initial airway management of prehospital cardiac arrest (REVIVE-Airways): a feasibility study research protocol. BMJ Open. 2013 Jan 31;3(2):e002467–7. Berlac P, Hyldmo PK, Kongstad P, Kurola J, Nakstad AR, Sandberg M. Pre-hospital airway management: guidelines from a task force from the Scandinavian Society for Anaesthesiology and Intensive Care Medicine. Acta Anaesthesiol Scand. 2008 Jul 9;52(7):897–907. Bosch J, de Nooij J, de Visser M, Cannegieter SC, Terpstra NJ, Heringhaus C, et al. Prehospital use in emergency patients of a laryngeal mask airway by ambulance paramedics is a safe and effective alternative for endotracheal intubation. Emergency Medicine Journal. 2014 Aug 14;31(9):750–3. Cook T, Howes B. Supraglottic airway devices: recent advances. Continuing Education in Anaesthesia, Critical Care & Pain. 2011 Mar 15;11(2):56–61. Deakin CD, Clarke T, Nolan J, Zideman DA, Gwinnutt C, Moore F, et al. A critical reassessment of ambulance service airway management in prehospital care: Joint Royal Colleges Ambulance Liaison Committee Airway Working Group, June 2008. Emergency Medicine Journal. 2010 Mar 19;27(3):226–33. Deakin CD, Peters R, Tomlinson P, Cassidy M. Securing the prehospital airway: a comparison of laryngeal mask insertion and endotracheal intubation by UK paramedics. Emergency Medicine Journal. 2004 Dec 20;22(1):64–7. Gruber C, Nabecker S, Wohlfarth P, Ruetzler A, Roth D, Kimberger O, et al. Evaluation of airway management associated hands-off time during cardiopulmonary resuscitation: a randomised manikin follow-up study. Scand J Trauma Resusc Emerg Med. 2013;21:10. Hasegawa K, Hiraide A, Chang Y, Brown DFM. Association of prehospital advanced airway management with neurologic outcome and survival in patients with out-of-hospital cardiac arrest. JAMA. 2013 Jan 16;309(3):257–66. Kajino K, Iwami T, Kitamura T, Daya M, Ong ME. Comparison of supraglottic airway versus endotracheal intubation for the pre-hospital treatment of out-of-hospital cardiac arrest. Crit Care. 2011. Mason AM. Prehospital Use of the Intubating Laryngeal Mask Airway in Patients with Severe Polytrauma: A Case Series. Case Reports in Medicine. 2009;2009(3):1–7. Middleton PM, Simpson PM, Thomas RE, Bendall JC. Higher insertion success with the i-gel® supraglottic airway in out-of-hospital cardiac arrest: A randomised controlled trial. Resuscitation. 2014 Jul;85(7):893–7. Moss R, Porter K, Greaves I, consensus group Faculty of Pre-Hospital Care. Pharmacologically assisted laryngeal mask insertion: a consensus statement. Emergency Medicine Journal. 2013 Dec;30(12):1073–5. Ostermayer DG, Gausche-Hill M. Supraglottic Airways: The History and Current State of Prehospital Airway Adjuncts. Prehosp Emerg Care. 2014 Jan;18(1):106–15. Ramachandran SK, Kumar AM. Supraglottic Airway Devices. Respiratory Care. 2014 Jun 2;59(6):920–32. Schmid M, Mang H, Ey K, Schüttler J. Prehospital airway management on rescue helicopters in the United Kingdom. Anaesthesia. 2009 Jun;64(6):625–31. Tanabe S, Ogawa T, Akahane M, Koike S, Horiguchi H, Yasunaga H, et al. Comparison of Neurological Outcome between Tracheal Intubation and Supraglottic Airway Device Insertion of Out-of-hospital Cardiac Arrest Patients: A Nationwide, Population-based, Observational Study. J Emerg Med. 2013 Feb;44(2):389–97. Wang HE, Szydlo D, Stouffer JA, Lin S, Carlson JN, Vaillancourt C, et al. Endotracheal intubation versus supraglottic airway insertion in out-of-hospital cardiac arrest. Resuscitation. 2012 Sep;83(9):1061–6. Good work! Really enjoyed listening, aimed at a nice level as well, with something to take away for everyone. Looking forward to the next one! This was great thanks so much, I will be a regular listener. Nicely presented, content accessible and delivered in a straightforward way. Great work.